If you like the sound of flute, it’s like flute but with your body,” says Sayan Bapa, a member of the Tuvan folk ensemble Huun-Huur-Tu, when Feedback asks him how he would describe Tuvan overtone singing for someone who has never heard it. We think that’s an apt description for the style, which involves creating multiple notes at once by manipulating the mouth, throat and vocal chords. You can’t really grasp what it really sounds like without hearing it for yourself, though. We remember our first experience: a rumbling, guttural Hhhhhhhmmmmmmmeeerrrrrrrrrraaaaaaaahhhhh emanated from our roommate’s bedroom, where he was teaching himself the vocal technique, also called throat singing, from resources on the Internet. A tragedy happened in the hostel of Tomsk University. A second-year-student, 18, was found hanged in the hostel on Saturday night, the city interior department reported. The young citizen of Tuva was known to have entered a Tomsk university. He had a girlfriend in Tomsk and was doing well in the university. His roommates described him as a sociable and friendly person who got on well with people. His friends referred to him as a person who was not capable of committing a suicide. 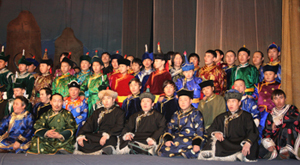 In Tuva a gala-concert in the Muzdramteatr (Music-Drama Theater) officially opened February 13 the Year of Khoomei. Khoomei is a unique vocal phenomenon, whereby in the performer's throat sounds of different pitches are created simultaneously. In effect, the person becomes like an orchestra. Today khoomei became the worldwide calling card of Tuva. In the summer of 2007 the art of Tuvan throat singing enraptured Vladimir Putin and his guest Albert II, Prince of Monaco. First Deputy Prime Minister Dmitry Medvedev, completing the working tour of Siberia, will spend this Thursday in Novosibirsk. He will participate in the Siberian Forum of Mothers here and will call a meeting on the demographic policy. The number of Russian population totalled 142 million people as of December 1, 2007 and decreased by 220,000 people (0.16 percent) as against the start of the year. This is less than in the corresponding period in 2006 when the number of Russians dropped by 520,000 people (0.37 percent). Otherworldly is an apt word to describe Tuvan throat-singing. 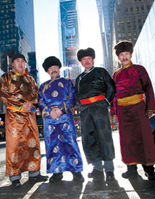 On Tuesday at the Rotunda, as the three members of Tuva's Alash gave deep voice to the first of a dozen numbers, listeners having their first live encounter with the Central Asian folk genre could be identified by their startled looks. 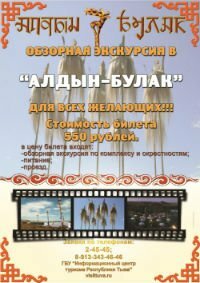 Developed over centuries among the semi-nomadic herdsmen of Tuva, where they could sing to each other over long distances, the eerie vocalizations have long been a national passion in the land bordering southern Siberia.